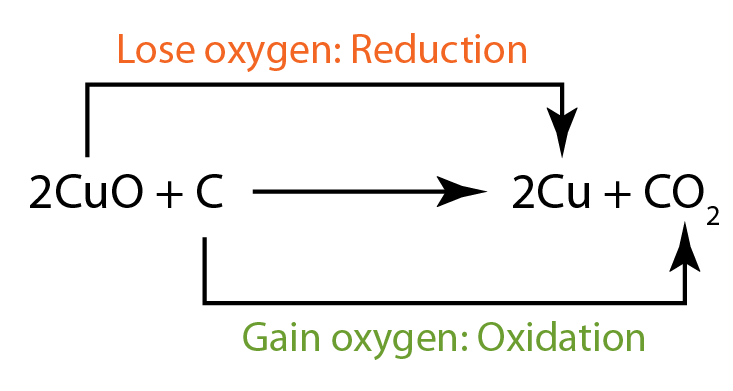 Oxidation is the process of gaining oxygen. Reduction is the process of losing oxygen. 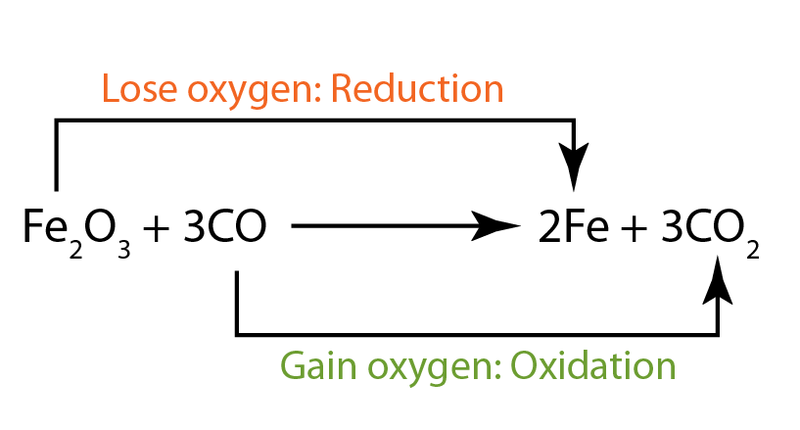 Iron(III) oxide loses oxygen. Iron(III) oxide is reduced to iron. This is a reduction process. Carbon monoxide gains oxygen. Carbon monoxide is oxidised to become carbon dioxide. This is an oxidising process. 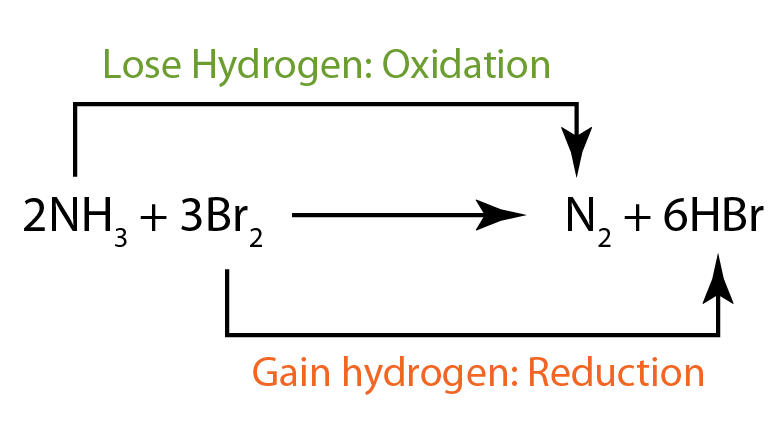 Oxidation is the process of losing hydrogen. Reduction is the process of gaining hydrogen. Ammonia loses hydrogen. Ammonia is oxidised to become nitrogen. This is an oxidation process. Bromine gains hydrogen. Bromine is reduced to become hydrogen bromide. This is a reduction process. Magnesium is oxidised to become magnesium oxide. Carbon is oxidised to become carbon dioxide. Zinc is oxidised to become zinc oxide. Water is reduced to become hydrogen gas. Hydrogen sulphide is oxidised to become sulphur. Chlorine is reduced to become hydrogen peroxide. Copper(II) oxide is reduced to become copper(II) metal. Ammonia is oxidised to become nitrogen gas. Oxidation occurs when a reactant loses electron. Reduction occurs when a reactant gain of electron. copper (II) ion in copper(II) oxide gains 2 electrons to form copper metal. This is a reduction process. Magnesium metal loses 2 electrons to form magnesium ions in magnesium oxide. This is a oxidation process. Magnesium is oxidised because it loses2 electrons to form magnesium ion, Mg2+. Copper(II) oxide is reduced because copper(II) ion gains 2 electrons to form copper metal, Cu. 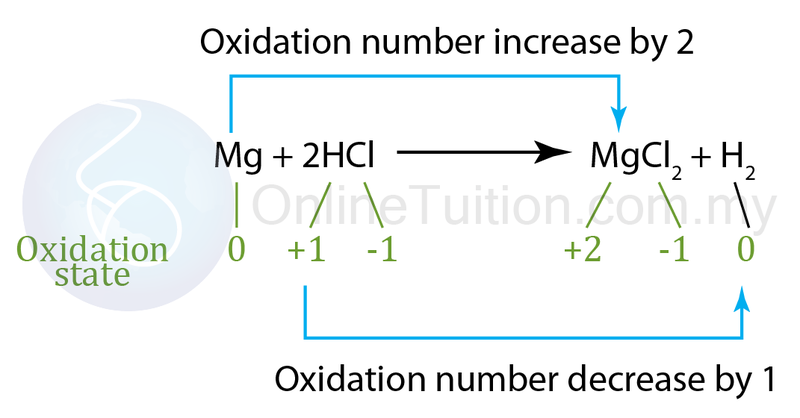 Oxidation state shows the total number of electrons which have been removed from an element (a positive oxidation state) or added to an element (a negative oxidation state) to get to its present state. 1. The oxidation state of an element is zero. 2. For a simple ion with single atom, the oxidation state is equal to the charge. Example 1: The oxidation state of oxygen is always -2 except peroxide, which is -1. Example 2: The oxidation state of hydrogen is always +1 except hydride, which is -1. 4. The sum of the oxidation states of all the atoms or molecule in a neutral compound is zero. 5. The sum of the oxidation states of all the atoms in an ion is equal to the charge on the ion. The sum of the oxidation state of each element in a compound are equal to the charge of the compound. This rule can be used to find the unknown oxidation number of an element is a compound. Find the oxidation state of all the elements in a Chlorate(V), ClO3– ion. Find the oxidation state of all the elements in a Potassium manganate(VII), KMnO4 ion. Find the oxidation state of all the elements in an Ammonium ion, NH4+ ion. You will have come across names like iron(II) sulphate and iron(III) chloride. The (II) and (III) are the oxidation states of the iron in the two compounds: +2 and +3 respectively. That tells you that they contain Fe2+ and Fe3+ ions. Transition metals always show difference oxidation state as shown in the table below. Non-metal elements (except fluorine) usually have more than one oxidation state. Another way to determine oxidation and reduction is to see the change of the oxidation state after a reaction. An atom is said to be oxidised when its oxidation state increases. An atom is said to be reduced when its oxidation state decreases. The magnesium’s oxidation state has increased by 2, from 0 to +2. Therefore, it has been oxidised. 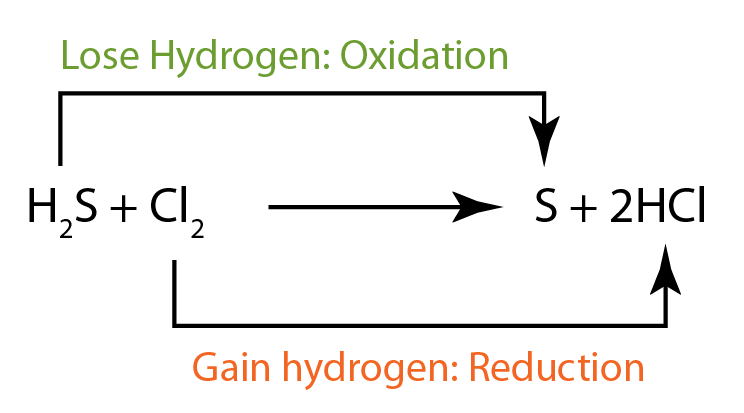 The hydrogen’s oxidation state has decreased by 1, from +1 to 0. Therefore it has been reduced. The chlorine is in the same oxidation state on both sides of the equation – it hasn’t been oxidised nor reduced. There is no change of oxidation state for all elements. This isn’t a redox reaction. In this example, we can see that the oxidation state of chlorine has increased and also decreased. Chlorine is oxidised and reduced, at the same time.